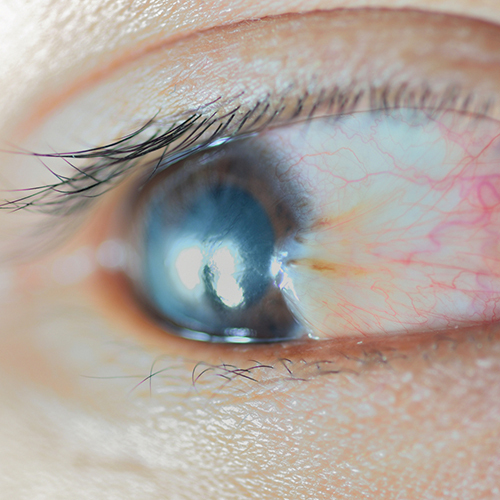 These are growths on or near the cornea, which are related to prolonged ultraviolet exposure from the sun. They are more frequent in latitudes near the equator where the solar exposure is the highest and in people who don’t wear sunglasses or hats to block the sunlight. A pterygium grows across the cornea causing redness and loss of vision from astigmatism and scarring. A pinguecula is a white or yellow mound of tissue near the inside or outside edge of the cornea which may get inflamed. Observation. In early or mild cases, this is often recommended. Anti-inflammatory eye drops can be prescribed if there is redness or irritation. Pterygium and pinguecula surgery. If there were loss of vision or persistent inflammation, this would be recommended. Minimally invasive surgery now includes the use of amniotic membrane transplantation with a tissue adhesive that reduces the need for stitches, decreases the recurrence rate and causes less discomfort after surgery.